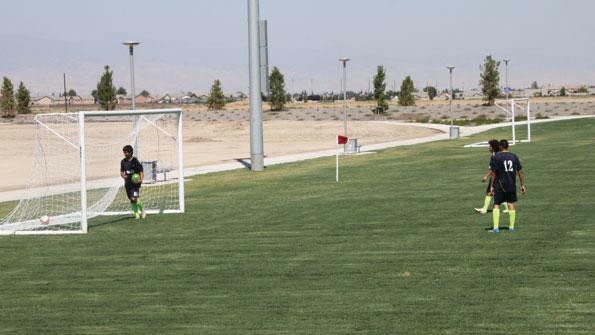 Bakersfield, Calif., opened the first phase of a master-planned sports complex last year that was funded by a combination of naming rights, partnerships, grants and park development fees. Once it is built out, the 200-acre Sports Village will contain 16 soccer fields, four youth football fields, 10 softball diamonds, a community center, paved walking paths and numerous picnic/children’s play areas. Building on Bakersfield’s history of partnerships and naming rights with public facilities that began in 2004 with the McMurtrey Aquatic Center, city staff negotiated a five-year lease agreement with American Youth Soccer Organization (AYSO), Region 73 to maintain and operate the first eight lighted soccer fields of the sports complex. Phase I development began in November 2009 and included the eight fields with concessions, restrooms and a parking lot. In addition to maintaining the fields, AYSO, Region 73 agreed to complete the interior of the concession stand for their operations. To save maintenance costs, the city installed a purple pipe system that uses tertiary water from the adjacent water treatment plant for irrigation of the fields. Park development funds were used to construct the fields, which opened in July 2011. City staff had sought naming rights for the complex since its inception, but no one would commit until the fields were completed. After opening day, State Farm agreed to a five-year naming rights deal for $500,000, to be paid in two equal installments early in 2012 to assist with construction of Phase II. Scheduled to open in 2013, the next phase will include four soccer fields and four youth football fields. The local youth football organization has agreed to maintain and operate the football fields, and contribute toward lights and goals. Once Phase II opens, more than 4,000 youth will be participating in active sports, in addition to various tournaments and adult sports leagues with year-round activities.